Platinum Group. Gold-Palladium Series, Palladium-Silver Series and Palladium-Platinum Series. 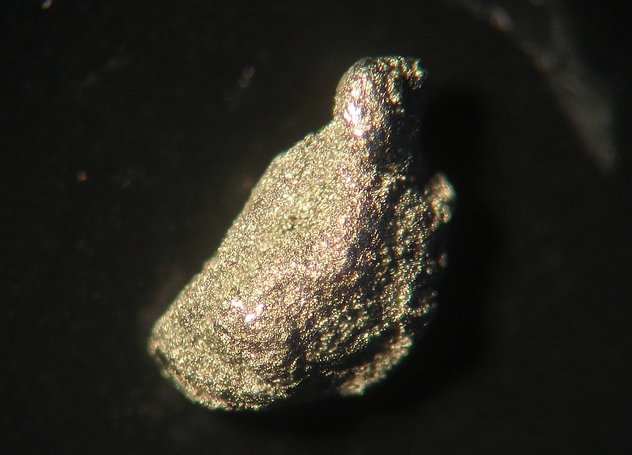 Natural Palladium always contains some Platinum. (Pd,Cu) alloys, some with the approximate composition PdCu4, are reported by Kapsiotis et al. (2010). Limonite 2 photos of Palladium associated with Limonite on mindat.org. Platinum 1 photo of Palladium associated with Platinum on mindat.org. Potarite 1 photo of Palladium associated with Potarite on mindat.org. Holgersson, Sedström (1924) Annalen der Physik: 75: 143. Palache, C., Berman, H., Frondel, C. (1944) The System of Mineralogy of James Dwight Dana and Edward Salisbury Dana Yale University 1837-1892, Volume I: Elements, Sulfides, Sulfosalts, Oxides. John Wiley and Sons, Inc., New York. 7th edition, revised and enlarged, 834pp. : 109-110. Cabri, L.J., Chen, T.T., Stewart, J.M., Laflamme, J.H.G. (1976) Two new palladium-arsenic-bismuth minerals from the Stillwater Complex, Montana. The Canadian Mineralogist: 14: 410-413. 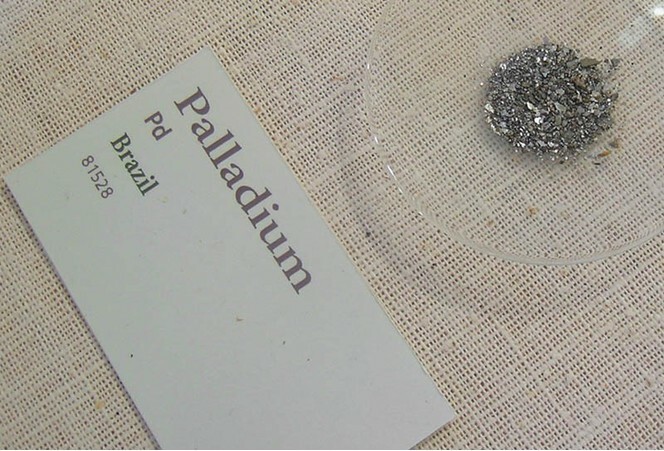 Fleet, M.E., De Almeida, C.M., Angeli, N. (2002) Botryoidal platinum, palladium and potarite from the Bom Sucesso stream, Minas Gerais, Brazil: compositional zoning and origin. The Canadian Mineralogist: 40: 341-355. Kapsiotis, A., Grammatikopoulos, T.A., Tsikouras, B., Hatzipanagiotou, K. (2010) Platinum-Group Mineral Characterization in Concentrates from High-Grade PGE Al-rich Chromitites of Korydallos Area in the Pindos Ophiolite Complex (NW Greece). Resource Geology: 60: 178-191. 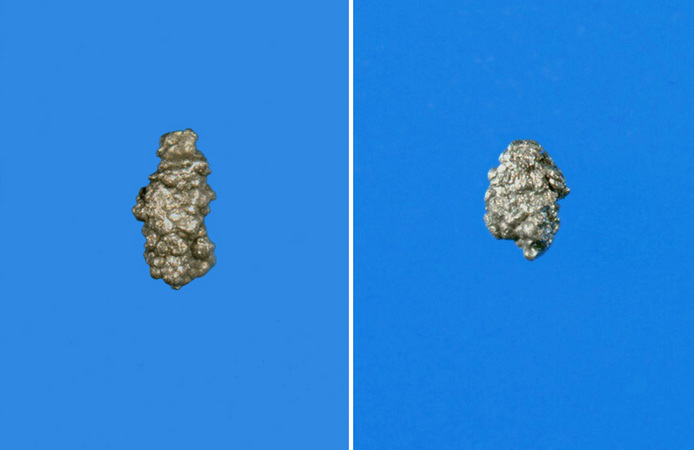 Bindi, L., Zaccarini, F., Garuti, G., Angeli, N. (2013): The solid solution between platinum and palladium in nature. Mineralogical Magazine 77, 269-274. Carlo Tortorella; G. A. Albertson Data; Cuzens, H. (2010) The Genesis and Spatial Distribution of Platinum-Group Elements in the Coronation Hill Deposit, Northern Territory, Australia. University of Western Australia. Canadian Mineralogist 34:547-557; Kwitko, R., Cabral, A. R., Lehmann, B., Laflamme, J. G., Cabri, L. J., Criddle, A. J., & Galbiatti, H. F. (2002). Hongshiite, PtCu, from itabirite-hosted Au–Pd–Pt mineralization (jacutinga), Itabira district, Minas Gerais, Brazil. The Canadian Mineralogist, 40(2), 711-723. Moorhouse W. W. (1942) The Northeastern Portion of The Timagami Lake Area, Fifty - First Annual Report Of The Ontario Department Of Mines, ARV 51, Pt. 6, Pg 24.
ⓘ Pravo-Ingamakitsk Cu deposit ? ⓘ Copper Hill Mine (Gold Eagle; Delaware Claims) ? ⓘ Hunting Hill quarry (Rockville Crushed Stone Quarry; Travilah Quarry; Rockville Quarry; Bardon Stone Quarry; Aggregate Industries Quarry) ? ⓘ Webster-Addie ultramafic ring dike ? ⓘ West Nottingham Township ?